Are the Limit’s of God’s Mercy Conditional? Has Osama bin Laden Been Forgiven? No one who lived through it will ever be able to forget the stark terror or the all-encompassing uncertainty that pervaded the scope of that horrible day. Although I was only eleven years old at the time I can remember September 11th, 2001 clearly, as if it were yesterday – as I’m sure countless other Americans do with pertinent imminence. During my religion class a spontaneous interruption was made by another faculty member at my school. Moments later, the religion teacher paused the class and revealed to us that the World Trade Center in New York had been damaged from a “bomb.” At this point, misinformation seemed to be rampant, and for the first half of the day this is what was reported and circulated throughout our school instead of the actual details regarding the two hijacked planes that flew into the towers. Later on – as news came of the plane that crashed into the Pentagon in Washington – more and more people became intensely alarmed, as the scope of this tragedy had moved increasingly closer to our own lives. As I watched the horrific pictures that streamed across the television screen that night I remember pondering, and wondering – who, or why would someone be behind such an atrocious action? As the whole nation and the world would learn that the mastermind behind these attacks was Osama bin Laden, the leader of the terrorist organization al-Qaeda, I was filled with even more fear and insecurity at the notion that a person across the seas was filled with so much hatred and contempt for our way of life as Americans that they consciously plotted and wished about our very annihilation. Overnight, the way in which we perceived ourselves in relation to the world had changed. Most Americans probably grasped this unsettling reality as those images of terror from New York, Washington D.C., and rural Pennsylvania would be broadcast unceasingly for the upcoming days and weeks following that tragic September morning. However, to me, the response to these heinous attacks against the United States by other Americans was equally as stunning as the actions that were perpetrated by the terrorists a world away. The very next day in my sixth grade classes, as all of my teachers tried to eloquently and objectively proclaim what had happened and why to all of us, one declaration was issued forth from my fellow classmates. “Nuke ’em!” Of course, this proposition mostly came from the mouths of all the boys in my class and might usually be perceived as the natural way in which a teenage boy, or any man for that matter, might react to such news. Yet, as the day went on it seemed that this call for retaliation was the shared view of most of my classmates – boys and girls – at the school. The same feelings would materialize throughout the nation and coalesce into an outright call for war. Less than a month later, President George W. Bush launched a U.S. led invasion of Afghanistan with the intention of eradicating al-Qaeda and finding, killing or capturing Osama bin Laden. Only earlier this month was this core objective of that mission accomplished, ten years later. Yet, the death of Osama bin Laden has reawakened probing questions about the real character of the values and underlying spirit that composes the makeup of the United States of America. 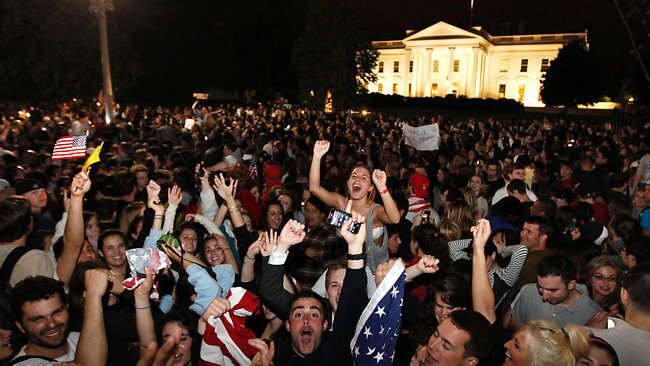 As the death of the leader of al-Qaeda was announced it was met with jubilation and celebrations of vindication, even outside the doors of the White House. Understandably, this event brought a prevailing, and perhaps final, sense of reassurance to those whose lives were personally affected by September 11th as a result of having to endure the painful deaths of loved ones. To feel closure if one was so intimately involved with such a horrible tragedy would only be natural. Even for those who did not lose family members, friends or associates – simply as an American, to know that the mastermind behind the attacks no longer walked the earth, it would be understandable to perhaps breathe a subliminal sigh of relief. But from the crowds that were celebrating outside of the White House the night the news was made public, to the ensuing atmosphere of exultation and joy that would characterize the nation’s response in its wake – it could be seen that a mere sense of closure and reassurance was not the reason a majority of Americans chose to celebrate the death of Osama bin Laden. The same sentiment would be echoed throughout the country as t-shirts and countless assortments of memorabilia would be created celebrating the premise that Osama bin Laden was now, indeed, in Hell. A CNN survey conducted shortly after the news of bin Laden’s death broke showed that 6 in 10 Americans believed or knew for certain that he had been consigned by God to eternal damnation. If anyone has been evil in the history of mankind it was certainly this man. But is responding to the death of an evil human being with jubilation justifiable? In the aftermath of the September 11th terrorist attacks on the United States candy was passed out to children on the streets in towns throughout the Gaza strip in the Palestinian territories. The terrorist assault on America was portrayed as a righteous strike against a nation of “infidels” by Islamic fundamentalists. Thus a laudable event to be extolled. How is the way many Americans responded to bin Laden’s demise any different? It seems that in this context religion has been used to justify the self-righteousness of some and to contribute to the inflation of one’s holy ego through the assurance of the condemnation of others. While the image of God as a wrathful adjudicator might comfort some who seek recompense or closure of some sort, ultimately it only serves to stoke the insecurities and prejudices of those who need someone or something to reject and look upon with disdain. Usually, to make themselves feel better, even in the spiritual scheme of things. Yet, when the question of divine judgment is invoked, the only answer Scripture seems to offer is, “‘Vengeance is mine’, says the Lord” (Deuteronomy 32:35, Romans 12:19). Jesus lays out an even starker picture, saying clearly that, “Your Father in heaven makes His sun rise on the evil and on the good, and sends rain on the righteous and on the unrighteous” (Matthew 5:45). If such a fundamental impartiality is divine in origin how can any human possess the knowledge of who has been gifted eternal salvation and who has merited everlasting damnation? The question goes even further still, if God desires that “all men be saved” and that “none should perish, but that all should reach repentance” (1 Timothy 2:4, 2 Peter 3:9) how can we be sure that any soul would be consigned for an eternity bereft of the love of God? This particular question is one that has been covered with great intensity in recent months throughout the theological field, but for convenience sake should serve as the topic of another post! The Psalms speak of God’s mercy as being “as far as the east is from the west” (Psalm 103:12). If Christians have been called by Jesus of Nazareth to imitate God in all that we say and do, wouldn’t exercising such a profound expression of mercy and forgiveness be the primary way to start? In Catholic theology, it has been greatly consoling to have recourse to the practice of prayer for the dead. Many great religions and spiritual traditions of the world have utilized this custom. It moves us all to understand that despite how much we may not have in common with a certain individual, nonetheless, we remain connected to them as a human being – made in the image of the living God. The Catholic tradition sees this prayerful act as aiding a soul that has passed beyond the confines of this life in the process of becoming pure and refined of all sinfulness, as complete union and beatitude with the divine Source of all is accomplished. A central facet of this deed is understanding that as humans we can never entirely know the fate of an individual who has departed this earth. Thus, we simply pray, in the hope that – through our own small collective spiritual efforts – we might help the departed in becoming purified of their faults and failings as mortal humans to glimpse the eternal Light of Love Eternal. Thus, I do not rejoice in the death of Osama bin Laden – rather I pray for the repose of his soul in the hope that he might be purified of the ignorance, hatred, and unconscionable actions with which he filled his life. A nation that revels in the demise of one man but does not work and pray for the illumination and liberation of a future generation is not the America I was brought up to believe in. Nor should anyone else. This entry was posted in Uncategorized by Phillip Clark. Bookmark the permalink. Phillip Clark is a social justice visionary, writer, and paralegal in Baltimore, Maryland. He is a contributing author to "Hyrsteria: A Zine of Social Difference" by Tanya Garcia and Valeria Molinari Interests include politics, theology, civil/human rights, social justice, LGBT rights, international relations, and history.